Summer always comes back and we have just the swag to make your next outdoor event even more memorable. Summer is coming which means it’s time for people to start planning those vacations. While getting away is common, more and more people are choosing to just relax as opposed to travel. One way that people are choosing to do so is to go to the beach. Everyone loves the beach. A day away from the stresses of life to enjoy time in the sun with family and friends. What better opportunity do you have to brand yourself? Using promotional products for the beach is a great way to do this. People who visit beaches are more relaxed and able to focus on things like advertising and branded images. According to a study by Washington University and the University of California Irvine, visiting a beach has a direct effect on a person’s mental state. So now that we know why people like to go to the beach, let’s look at some statistics that will help you understand the number of potential brand impressions you can receive from promotional products. Wondering if there are enough beach goers to get those coveted brand impressions? Take a look at a few of these numbers. In California alone, more than 50 million people visit beaches, accounting for 150-400 million visits per year. The most crowded beaches are not isolated and encompass numerous states including Florida, California, New York, Hawaii, Virginia, South Carolina, and Maryland. The top 10 most crowded beaches have more than 90,000,000 combined visitors each year. Beaches are for more than just relaxing. According to the EPA, they are frequently used for boating, fishing, walking, swimming, and bird-watching. Beach vacations are free and one of the time destinations for those who want to get away while not spending any money. In order to increase your brand presence, you need to give away promotional items that are useful to the people who receive them. Promotional items for the beach meet this criterion. For seventy one percent of consumers, usefulness is the top reason for why they keep a promotional product. If it’s something that they won’t use, then they will likely get rid of it. Beach products are useful and will generate plenty of traffic for your company. Just think about it. A branded product representing your company to potentially 90 million people. That’s a pretty good return on your investment considering most promotional products cost pennies per impression. Also remember that 52% of people who receive a promotional item are likely to do business with the company that gave it to them. If you decide not to use promotional items for the beach, your competitors could be the ones who winds up in the 52%. Okay. So now that you know the benefits, let’s take a look at the five most popular promotional items for the beach. Drinkware is a very popular promotional item. 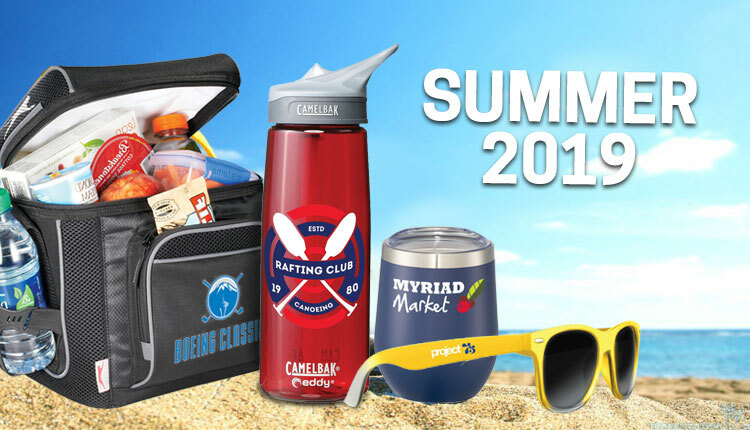 But, how does promotional drinkware fit into a promotional campaign for beach items? Trying to consume a cold beverage at the beach can be difficult for a number of reasons. The first is because it’s hard to keep them cold. Even when you have a cooler, they heat up quickly once exposed to the sun. That’s why can coolers are a smart choice for beach goers, and is a promotional item that anyone can enjoy. Can coolers are sleeves that hold cans and help maintain their cool. You can wrap these around cans inside a cooler or simply slip them on once you take one out. You can purchase these in various sizes and colors, and they are an inexpensive way to have plenty of beach swag for your next marketing event. Sand can also be a pest when you’re trying to drink at the beach. Using an item such as a vacuum bottle with a cap can help eliminate drink contamination. It can also help keep drinks cold just like can coolers. Food items are also difficult for the beach. Why not use a promotional thermos as a way to promote your brand while helping people keep their food hot/cold at the beach. Speaking of keeping drinks cold, everyone at the beach must start with a good insulated cooler. Imagine having people keep their drinks cold in a cooler that shows off your company logo. Coolers come in all sizes from smaller lunchbox size coolers to larger chests that hold enough drinks to supply your whole party at the beach. Materials range from insulated nylon for smaller coolers to industrial plastic with rollers for larger coolers (45 to 85-quart size). There are also coolers with stands, carrying straps, and even backpack coolers. If you are all about name brands, we have you covered at iPromo. Check out our line of Yeti coolers and tumblers which make perfect beach promo items. We even carry other popular brands such as Coleman and Koozie. Of course, beach towels are popular. People don’t go to the beach without a towel. In fact, most people have a special towel specific for the beach that they use ONLY for the beach. Why not make it a towel with your logo? Don’t just think of logos when you think of beach towels. Many can be printed with specific branding images such as pictures related to your brand, and even messages that help people remember who you are. With such a large area for customization, beach towels provide a large canvas to market your brand. Beach bags are used by everyone who take trips to the beach. Where else are they going to carry all of their beach swag? Even if your competitor happens to beat you out with beach towels and drinkware, it can still be YOUR bag that carries all of the items. 73% of consumers in the Untied States own a promotional bag, making then the 4th most owned promotional item next to t-shirts, drinkware, and writing instruments. Promotional bags generate approximately 3,300 brand impressions for your company throughout their lifetime. Promotional bags cost approximately 2/10th of a penny per impression (based on a bag price of $5). On average, 50% of people who were given a promotional bag are likely to do business with the advertiser who supplied it to them. With these type of statistics, you can see that promotional bags make a great investment and are a good use of your marketing budget. What other type of advertising can get you so many impressions at a cost of less than a penny per? People no longer show up to the beach without some type of waterproof container. Experienced beach goers know that their valuables are susceptible to getting sandy and wet, yet they still decide to bring them. The market for waterproof containers has exploded since the invention of the smartphone which people no longer leave home without. Waterproof containers range in size and shape. There are smaller containers that hold cash and identification and larger containers that hold iPhones and other electronics. Materials also range from canvas to plastic, but all have a waterproof type lining or material to help keep your items dry. Regardless of the items you choose, at least you know that using promotional beach items is an affordable way to gain valuable impressions for your brand. From drinkware to beach towels, put your name out there for everyone to see. With the majority of people doing business with people who give them promotional items for the beach, you can’t afford to let your competitor be the person who supplies people with these products. There are plenty of items out there to fit any budget and it cost you less than a penny per brand impression to stock up. If you are unsure of which item(s) is best to fit your campaign and budget, give a call to one of our product specialists who can help you find the right products at the right price.